Pave settings are talked about so often in the jewelry industry, but most people don't know what they are outside of the business. Simply put, a pave setting is made up of many small gemstones, and are often consisted of diamonds, which are set closely together. The gems are separated and held in place by little beads of the setting's metal. The beads are either pulled from the existing metal in the setting, or they are soldered on. Beads virtually disappear into the background, and the result is what looks like a continuous surface of diamonds or other gems. However, this setting should not be confused with calibre-cut settings. The calibre technique refers to a smaller and custom-cut stone in bigger jewelry designs. Usually, these stones line up perfectly together, ensuring that there are no gaps between the stones. Most often, there are emerald, sapphire, and ruby stones used in calibre cuts. Diamonds are rarely fully used unless they have a particularly interesting color. Pave diamond settings are often used in engagement rings and help create the illusion of larger center stones. The small beads used to set the accent diamonds to add a vintage or traditional look to engagement rings. The ring pictured, for example, has pave set diamonds as well as a milgrain detail. Milgrain is a tiny row of beads that act as a border on a ring. The beads of the milgrain match the beading of the pave set diamonds beautifully. Both milgrain and pave settings were used during the Edwardian and Art Deco eras during World War I. A diamond halo consists of a row of diamonds set around a center diamond. Most halo settings are also pave settings because pave settings take up less space. In rare cases, when the halo uses very large accent diamonds, the stones may be set into a prong setting. Pave settings are more secure than bezel settings for this type of mounting. A bezel setting is when diamonds are set underneath a straight sheet of metal, and the resulting look is much more modern and can minimize how large a diamond looks. The engagement ring pictured has a pave set shank with a milgrain detail along the borders. The advantage of this type of setting is that the diamonds are almost flush with the beads, unlike prongs that can poke. They also add a vintage appeal to an engagement ring. Some pave diamond settings are jam-packed with many small diamonds. One con of this type of setting is that the diamonds tend to fall out. This is especially true if the pave setting goes far down the shank, like on an eternity band, or if the diamonds are smaller than .005ct. 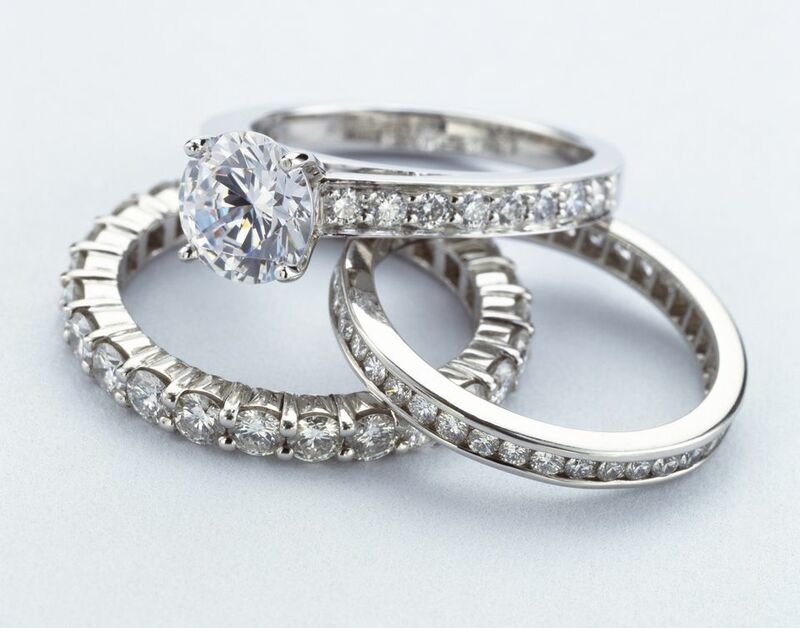 Ultimately, the right engagement ring depends on a budget, ring style, and its ring settings. For example, you might go for a classic or modern engagement ring, and use a halo setting that features scalloped pave diamonds that circle the center gem. You'll also want to choose a gemstone that's right for you, though the most obvious one is the diamond. If you decide to use a diamond, make sure you understand its cut, color, clarity, and carat.